This week I’m not able to spend much time here at the computer, but I don’t want you to think I disappeared, so I’ll just share with you a favorite staple recipe I like to keep on hand. 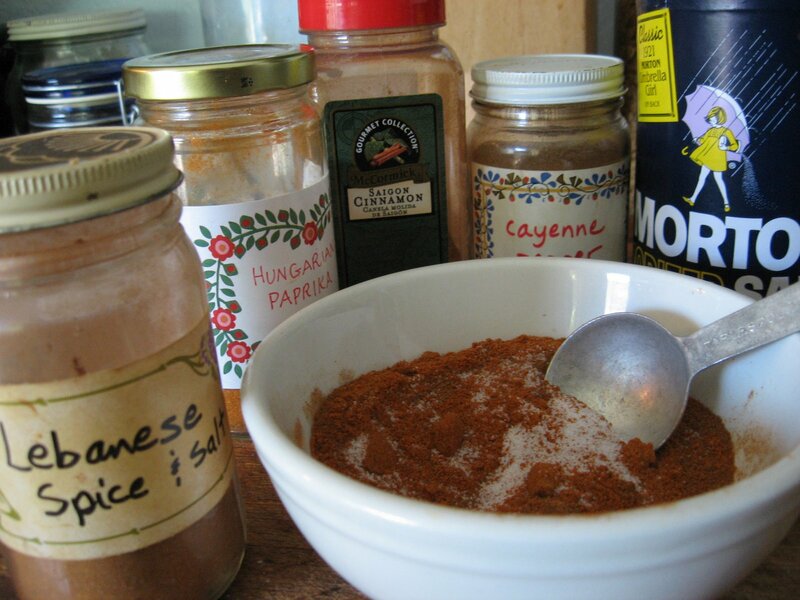 I have been using this combination of spices and salt for decades. It did come from an authentic Lebanese cook, perhaps via Sunset Magazine. My adaptation is lower in salt and cayenne pepper than the original. You can tweak the proportions to suit your own taste. Typically it is used to flavor ground beef or lamb; the suggestion was to add 2 teaspoons to one pound of meat. I’ve used it in stews as well. I love that little bit of cinnamon surprise. Great little picture, it really communicates your kitchen with the hand made labels and variety of brands. Now go back to your chair and put that foot up. Interesting! I'll have to try it! Thank you!